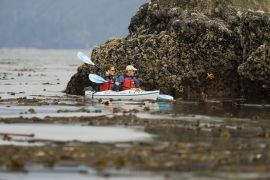 Sea kayaking is a great way to enjoy the beauty of BC’s coastline and lakes. These tips help make that first trip of the season a safe and enjoyable experience. Courtenay, B.C. – At this time of year many people are getting ready for their first sea kayaking trip of the year – looking forward to fresh air, exercise, and unparalleled access to wildlife in its natural environment. 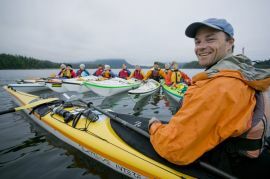 To help make sure that first trip is a safe, enjoyable paddle, Dave Pinel – owner of West Coast Expeditions, offers some easy-to-follow advice for anyone getting ready for their first kayak trip of the season. On the physical side, Pinel points out that while kayaking relies on your hands, arms, and shoulders to control the paddle, much of the exertion comes from your core muscles. Lower body strength and flexibility also helps in building power and boat-handling skills says Pinel. To stay safe on the water, Pinel believes a little preparation goes a long way. Pinel suggests keeping your paddling gear in a dedicated tote box, along with a contents list. Most beginning paddlers start out by renting equipment and using the gear that comes as part of the package. For those who catch the kayaking bug, but aren’t yet ready to buy their own boat, Pinel says there are two pieces of equipment worth owning. Pinel believes comfort is the key to a great paddle. For post-paddle skin care, Pinel recommends high quality coconut oil to moisturize and soothe skin exposed to the elements. 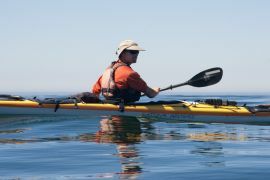 Lastly, this veteran of countless paddling expeditions reminds both novice and experienced paddlers to make sure they give themselves lots of time to enjoy their adventure. Annual Sustainability Award Nonimations Are Now OPEN! Photo credits: Bruce Kirkby, Boomer Jerritt, Mike Byrne, Isabelle Groc, Robert Yone, Gordon Ross, Dan Cullen, Fran Solar, Tim Solar, Leon Levasier, Bertrand Groulx, Caroline Fisher, David Pinel, and others!